Losar is the Tibetan New Year, a three-day festival that mixes sacred and secular practices — prayers, ceremonies, hanging prayer flags, sacred and folk dancing, and partying. It is the most widely celebrated of all Tibetan festivals and represents a time for all things to be purified and renewed. 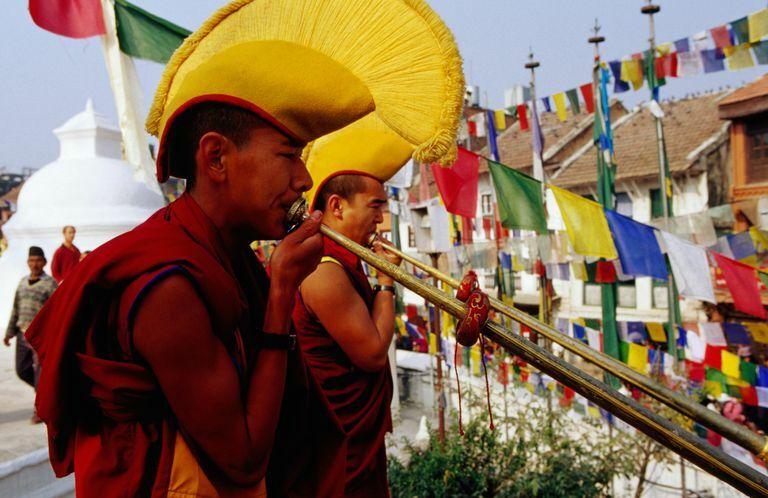 Tibetans follow a lunar calendar, so the date of Losar changes from year to year. It is held on February 27 in 2017, February 17 in 2018, and February 5 in 2019. It sometimes falls on the same date as Chinese New Year, but not always. During the month before Losar, Tibetan households draw the eight auspicious symbols and other signs on walls with white powder. In monasteries, the several protector deities — such as Dharmapalas and wrathful deities — are honored with devotional rituals. The devout Tibetan Buddhist begins the new year by honoring his or her dharma teacher. Guru and disciple greet each other with wishes of peace and progress. It is also traditional to offer sprouted barley seeds and buckets of tsampa (roasted barley flour with butter) and other grains on home altars to ensure a good harvest. Laypeople visit friends to wish them Tashi Delek — "auspicious greetings"; loosely, "very best wishes." His Holiness the Dalai Lama and other high lamas gather in a ceremony to make offerings to the high dharma protectors (Dharmapala) — in particular, the Dharmapala Palden Lhamo, who is a special protector of Tibet. The day also includes sacred dances and debates of Buddhist philosophy. The second day of Losar, called Gyalpo ("King's") Losar, is for honoring community and national leaders. Long ago it was a day for kings to hand out gifts at public festivals. In Dharamsala, His Holiness, the Dalai Lama, exchanges greetings with officials of the Tibetan government in exile and with visiting foreign dignitaries. On this day, laypeople make special offerings to the dharma protectors. They raise prayer flags from hills, mountains, and rooftops and burn juniper leaves and incense as offerings. The Dharmapalas are praised in chant and song and asked for blessings. This ends the spiritual observance of Losar. However, the subsequent parties may go on for another 10 to 15 days. Although Losar itself is a three-day festival, festivities often continue until Chunga Choepa, the Butter Lamp Festival. Chunga Choepa is held 15 days after Losar. Sculpting yak butter is a sacred art in Tibet, and monks perform purification rituals before crafting brightly colored, elaborate works of art that are put on display in monasteries.